Stefan Rebmann is a German MP and the centre left SPD parliamentary group’s spokesperson for development policy. We all acknowledge the benefits of providing life-saving vaccines for millions of children around the world. In some of the remotest places on earth, vaccines were delivered by health workers who often risk their lives to give new generations an opportunity to grow up without a devastating disease. These healthcare providers work tirelessly, year after year, motivated by the simple fact that we are on the verge of eradicating a human disease for only the second time in history. Since the launch of the Global Polio Eradication Initiative (GPEI) in 1988 – the largest public-private partnership for health – more than 2.5 billion children have been vaccinated against polio. Health experts estimate that over 15 million people would be paralyzed today had they not received the polio vaccine. There is no cure against this crippling disease, but it can be prevented with a safe and effective vaccine which has existed for over a half century. Since 1988, polio has decreased from an estimated 350,000 cases in more than 125 endemic countries to just 74 reported cases in Pakistan and Afghanistan in 2015. These two remaining polio-endemic countries need the EU’s political and financial support to eradicate polio once and for all. Polio eradication should be a priority for all countries, and follows the EU’s Written Declaration on continued European Union support, whose signatories called upon the European Commission to allocate appropriate levels of funding for polio vaccination campaigns and continued surveillance over the next four years. Final eradication of the remaining polio cases is difficult, yet achievable if we pool our efforts. 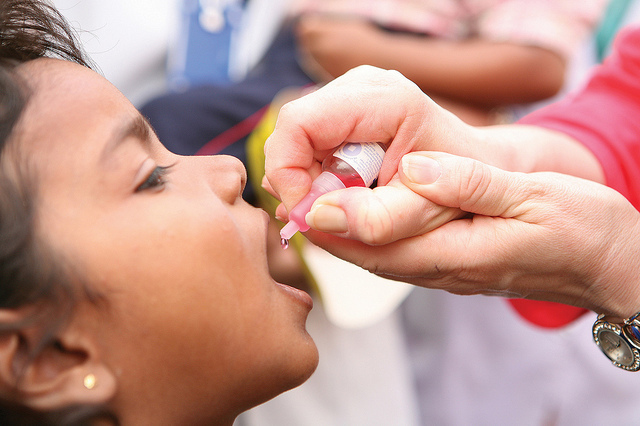 In its Eradication and Endgame Strategic Plan, the GPEI outlines the requirements for achieving a polio-free world, emphasising a strengthening of immunisation programmes to boost immunity and help introduce new vaccines. The German government has been a strong and reliable partner to the GPEI since the beginning of the initiative. The government has supported the polio fight with more than $500 million, and was the first donor to pledge an additional €100 million to finance the GPEI Endgame Strategy. But eradicating polio is a challenge beyond any one country or organisation, and cannot be left at the door of those countries where cases continue to be found. The EU should lead the way by encouraging its members to increase their commitment to polio eradication and create a blueprint for taking on tomorrow’s threats to global public health. One might ask: why this urgency? Why should we care about a couple of polio cases thousands of miles away? There are more pressing issues on our agenda, like the migrant crisis or the security challenges of the upcoming Euro 2016 football championship, especially after the terror attacks in France and in Belgium. Nobody denies that those issues need to be tackled as well, and by taking on polio we are also bolstering our emergency preparations. We should not be fooled by the low number of polio cases. Until polio is eradicated, all countries remain at risk, and Europe is no exception. The two children paralysed by a polio outbreak in Ukraine in September 2015 offer a stark reminder, and the World Health Organisation urged the Ukrainian government to declare a state of emergency. These two cases of polio resulted from a very low level of immunization in the country, putting thousands of children at risk in Ukraine and in neighbouring countries. Funding the final steps to a polio-free world will cost the global community an additional $1.5 billion. This is money well spent. We know that childhood immunisation is one of the most cost-effective public health interventions available. Global polio eradication efforts have already generated net benefits of $27 billion and could save up to $50 billion in direct and indirect healthcare costs by 2035, not to mention the immeasurable alleviation of human suffering. To ensure that the investment in polio eradication will serve humanity long after polio is wiped out, the polio eradication plan outlines a process for the responsible and effective transfer of the polio programme’s knowledge and where appropriate, its assets. The programme’s surveillance and response network has already been used to combat other diseases and to react to emergencies. In fact, the polio vaccination infrastructure proved crucial in eliminating Ebola in Nigeria. When the first Ebola case was confirmed in July 2014, health officials immediately repurposed polio technologies and infrastructures to detect Ebola cases and trace all contact with infected persons. By having real-time information, knowledge and resources concentrated in one location, an outbreak can be addressed very efficiently. The lessons learned in polio eradication were one of the reasons Ebola was brought under control so quickly in Nigeria. But other countries were not so well prepared, which underscores the importance of ensuring the polio eradication legacy is universal. The Ebola virus ‘crippled’ Sierra Leone’s health system, and tragically, the country’s important gains in maternal health over the last decade were decimated. Outbreaks such as Ebola and Zika are not just a nightmare for any country’s healthcare system, they are also warnings against complacency if our progress in global public health is to be sustained. Failure to stop polio in the last remaining areas could result in as many as 200,000 new cases every year, within ten years, all over the world. Success, on the other hand, means that no child will ever again suffer the terrible effects of lifelong polio-paralysis.